Heat oven to 350°F (325°F for dark or nonstick pans). Spray bottoms and sides of two 8- or 9-inch round cake pans with baking spray with flour. Make and bake cake mix as directed on box, using 1 cup water, the oil and eggs. Cool 10 minutes. Remove from pans to cooking racks. Cool completely, about 1 hour. Refrigerate or freeze 30 to 60 minutes for easier handling. For body, cut 1-inch slice from edge of one cake. From cut edge, cut out small inverted U-shape piece. Place body on tray. From remaining cake, cut head and tail. Arrange head and tail pieces next to body. Spoon frosting into large bowl. Stir in enough food colour until desired green colour. Spread thin layer of frosting over cake pieces to seal in crumbs. Refrigerate or freeze cake 30 to 60 minutes to set frosting. Frost cake pieces with remaining frosting. Use milk chocolate candies for spikes along back of dinosaur. Decorate body with assorted candies. Use 2 candy-coated chocolate candies for eyes and white decorator icing to make centres of eyes and teeth. Store loosely covered. 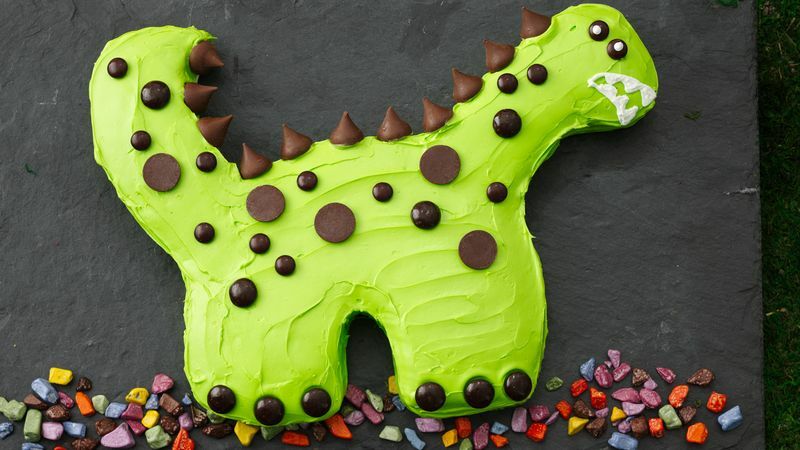 Use a variety of candies, like chocolate rocks and chocolate chips, to make your dinosaur come alive. Serve your dino on a large rectangular cheese slate or make a display board by covering a sturdy piece of cardboard with colourful wrapping paper, foil or cooking parchment paper.